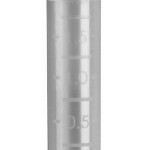 Tubes have frosted side labeling surface a thin membrane cap that can be pierced easily by a syringe. procedures that don't require the strength of SuperSpin™ tubes. are designed to use far less plastic than other tubes. proteins and are clear enough to be used in a spectrophotometer like SuperSpin™ tubes. resin that can interfere with your ability to detect DNA. tube easy to open and close even though it seals better than most tubes. hundreds of pounds of plastic in a typical lab every year. have been reground and used again. They also often include a clarifying agent to improve their clarity. less material to be just as strong.